Nearly 150,000 nose surgeries were performed in the United States in 2016, according to statistics provided by the American Society for Aesthetic Plastic Surgery. As one of the most popular plastic surgery procedures, nose surgery has incredible versatility. Every one of the following issues that people may have with their noses can be fixed by one of our expert plastic surgeons with a one-time surgical procedure here at Southwest Plastic Surgery. A common complaint is that the nose is disproportionate to the facial structure. The nose may be too small or too big, and its awkward size can cause it to stand out. Rhinoplasty can adjust the size of the nose so that it is balanced and blends seamlessly with the surrounding facial features. The angle of the nose can also be displeasing. If the angle between the nose and forehead is too sharp, the nose may appear short. If this angle is too shallow, the nose may appear long. The angle of the nose in relation to the upper lip also affects the overall appearance of the nose. Your rhinoplasty surgeon will examine your nose from all angles and create a personalized plan to restore natural-looking angles for a more attractive nose. If the nose is too wide, it may need to be built up. Through nose surgery, the bridge can be reinforced so that the nose is narrower in the front and has greater projection from the profile. Nostrils that are too wide, large, small, or narrow can draw unwanted attention. With nose surgery, the width and size of the nostrils can be adjusted by removing tissue to reduce flaring or adjusting the angle and/or nasal tip. The tip of the nose is a concern for many rhinoplasty patients. Whether your nasal tip is ill-defined, hooked, bulbous, droopy, or upturned, rhinoplasty can normalize its appearance so that your nose looks more natural, well-defined, and balanced. Indentations or depressions, especially along the nasal bridge, can be the result of genetic abnormalities or injuries. 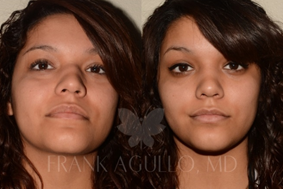 Rhinoplasty can fill out these indentations to create a smoother and more defined bridge. A nose that projects excessively or insufficiently can dramatically affect your profile. 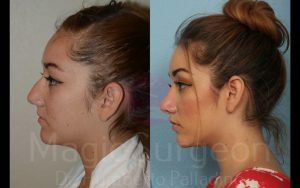 With rhinoplasty, the nose can be redefined and either reinforced or minimized so that the nose, forehead, mouth, and chin all appear balanced from the profile view. Rhinoplasty can resolve each of these concerns and improve the appearance and function of your nose. To request your personal consultation with one of our plastic surgeons, please call (915) 590-7900 or contact us online today.